How many times have you heard someone say that no amount of exercise can undo a bad diet? The truth is that weight loss experts are in agreement this is the case. They agree that what you eat is much more important than exercise when it comes to losing weight. With that said, many people still have trouble limiting their calorie intake to the amount necessary to maintain their current weight or lose a few extra pounds. Whether this is because of the marketing efforts of the food industry, being hit with the need to emotionally eat, or just being disconnected from hunger cues – overeating is becoming more and more of a problem by the day. Over one-third of American adults are classified as being obese, with double that many being considered overweight. It’s believed that this statistic will only grow over the coming years. It, therefore, makes sense that there has also been an increase in interest in – and demand for – prescription appetite suppressants. Let’s take a closer look at these prescription appetite suppressants; including who should consider taking them and the different varieties that are available for consumers. What are Prescription Appetite Suppressants? As the name suggests, a prescription appetite suppressant is a medication prescribed by a doctor that helps you to eat less. These pills primarily work by stimulating the central nervous system (CNS). They trick the body into initiating a response similar to the “fight or flight” response. This reaction increases energy and suppresses appetite. The extra adrenaline means that you don’t think about food as much either. When you do eat, the hunger you feel is less urgent. The chemical change of the reaction boosts your energy levels and enables you to complete your daily exercises too. The medication works inside and out to help you eat less and be more active. The combination of effects practically guarantees weight loss success. It’s important to note that prescription appetite suppressants force your body to maintain a near-constant state of simulated stress. That’s why they should only be taken for the short-term. They are typically prescribed for less than three months, but your doctor might prescribe a second round of medication after taking a break if they deem it necessary. These medications are among the most popular and effective ways to get started losing a lot of weight, but they can’t do everything for you. You should still establish a solid workout routine and change your eating habits to reach your long-term weight loss and weight management goals. Can I Take Prescription Appetite Suppressants? Exogenous obesity is when extra fat is stored due to an energy imbalance. This form of obesity is common for people who eat more calories than they burn. It is different from endogenous obesity, which is caused by metabolic and hormonal imbalances (such as hypothyroidism). Given that these appetite suppressants are intended to make you eat less and move more, they are designed for those with exogenous obesity. If there is another reason that you’ve put on weight, be sure to talk to your doctor to address any underlying issues. The second factor that determines if someone is prescribed appetite suppressants is BMI, or body mass index. BMI uses height and weight to estimate a person’s weight status. A healthy BMI is between 18 and 25.9. An overweight person is considered to be someone with a BMI of between 26 and 29.9. Obesity is classed as having a BMI of over 30. These are the people who can benefit most from using prescription appetite suppressants. They can also be prescribed to someone with a BMI between 27 and 30 if they are dealing with weight-related issues such as type 2 diabetes and hypertension. Talk to your doctor as they are in the best position to determine if prescription appetite suppressants are right for you or not. This is because they may still be a bad choice even if you do meet the two prescription criteria outlined above. There are health risks associated to the medications, and they should only be used under medical supervision. If you are interested in using appetite suppressants, then you should first consult your doctor. They can review your medical history, any medications you are taking, and your weight loss goals to determine if it would be a good fit for you or not. Most people have heard of phentermine, which is the most popular weight loss medication, but it isn’t the only choice. Here are the most popular prescription appetite suppressants – also known as anorexiants – available to patients. There are other prescription weight loss drugs available that eliminate cravings, promote satiety, and prevent fat absorption. Phentermine is named for its active ingredient; phentermine HCI, a substance with a similar chemical structure to that of amphetamines. That said, phentermine HCI is not itself an amphetamine. Phentermine can be used legally as long as it is under the prescription and supervision of a medical professional. However, given the amphetamine-like chemical structure of phentermine, it works as a potent stimulant and may be habit-forming. This is why it is classed as a class IV controlled substance both in the United States and in countries around the world. The most common brand name for phentermine in the United States is Adipex-P, which is also known simply as “Adipex”. It is also sold under the names Suprenza, Lomaira, Ionamin, and Duromine. Qsymia is a prescription appetite suppressant that contains phentermine which is becoming more popular by the day. It stands out because it also includes the anticonvulsant topiramate. While taking phentermine does increase energy and suppress appetite, topiramate boosts satiety and makes your food less appealing. This combination works wonders for losing weight quickly. 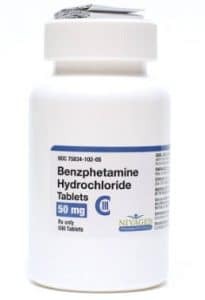 Benzphetamine HCI, also known as just benzphetamine, is another prescription appetite suppressant. The most common brand names for this anorexidant are Didrex and Regimex. It works similarly to phentermine, in that it stimulates the central nervous system in order to increase energy and suppress appetite. It’s also a controlled substance, albeit a class III one. Potency is the main difference between benzphetamine and phentermine. Phentermine is a more powerful medication, which should be taken just once a day (such as the 37.5mg dose of Adipex). Benzphetamine can be taken two or three times a day, depending on the needs of the patient taking it. This demand for a less potent alternative to phentermine is diminishing as companies have started creating smaller doses of phentermine, such as Lomaira which comes in 8mg doses. Diethylpropion is another common sympathomimetic amine. The active ingredient in this medication is diethylpropion HCI. It stimulates the central nervous system and is available in instant release tablets. This medication is only prescribed to people with a BMI over 30. The most common brand names for it are Tenuate and Tepanil. Much like the other medications in our list, it works by suppressing appetite and boosting energy levels. It is also a controlled substance; a schedule IV controlled substance to be precise. 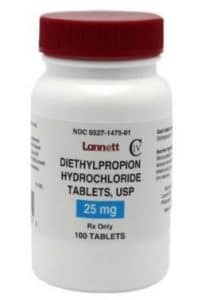 Diethylpropion produces similar results to the other appetite suppressants on the list, but different people respond differently to each medication because of their active ingredients. Diethylpropion, like Benzphetamine, is weaker than phentermine. However, depending on any side effects and your own personal preference, your doctor may choose to prescribe one medication over another. Last but not least on our list of sympathomimetic amines is phendimetrazine. The active ingredient in this medication is phendimetrazine tartrate. The most common brand names for this appetite suppressant are Bontril, Adipost, and Melfiat. This medication is available as both an immediate-release and slow-release pill. Much like the other medications in our list, it works by stimulating the CNS to trigger a biological response. 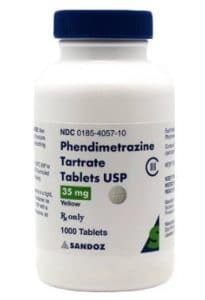 Phendimetrazine is classified as a Class III controlled substance. Phendimetrazine and phentermine work in much the same way. Once again, the primary difference between the two is how the user tolerates and responds to the active ingredients. 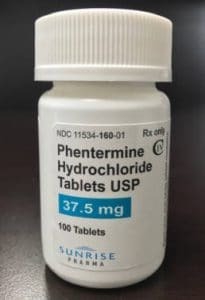 Some phentermine users have told us their doctor will witch them between phentermine and phendimetrazine to prevent building tolerance to one or the other. As always, be sure to talk to your doctor about prescription appetite suppressants. That way, you can get the best medication for your needs. As well as prescription appetite suppressants, there are some other prescription weight loss drugs to be considered. Belvic, Contrave, Qsymia, Saxena, and Xenical are all popular options in the United States. Rather than stimulating the CNS, these medications stimulate the brain and body in different ways to prevent decrease how many calories you consume and how many your body absorbs. Fewer calories mean that you lose more weight. Don’t worry if you can’t obtain prescription appetite suppressants. There are many over-the-counter supplements that work to reduce your appetite and boost energy! 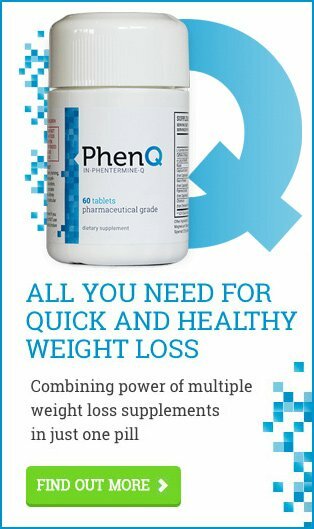 Our official recommendation when it comes to non-prescription appetite suppressants is PhenQ. This is a dietary supplement that is designed to increase energy and reduce appetite with a combination of nine potent all-natural ingredients. It is free from any additives, chemicals, and controlled substances. As such, it can be purchased online without the need for a prescription. Last updated: March 26th, 2019. Bookmark the permalink.